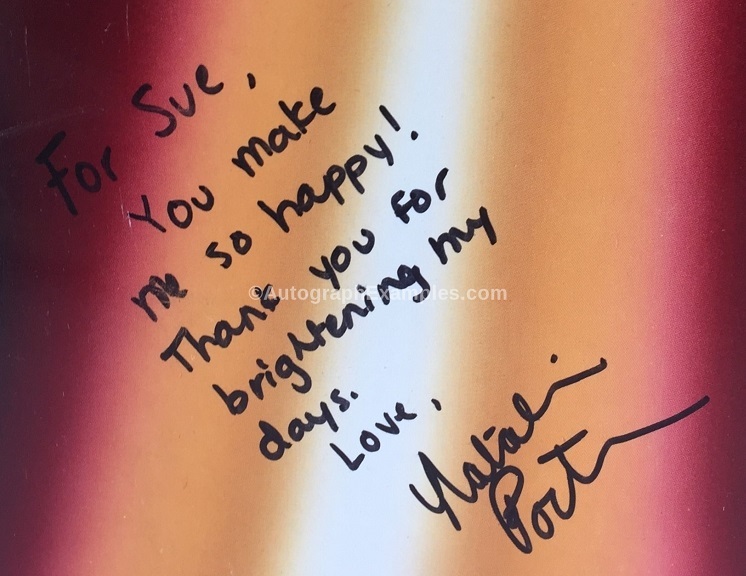 Authentic Natalie Portman autograph for her hair stylist in Star Wars. Natalie Portman (born Neta-Lee Hershlag; June 9, 1981) is an actress, film producer, and director with dual Israeli and American citizenship. She is the recipient of various accolades, including an Academy Award and two Golden Globe Awards. Portman made her feature film debut as the young protégée of a hitman in Léon: The Professional (1994). Additionally, while still in high school, she gained international recognition for starring as Padmé Amidala in Star Wars: Episode I – The Phantom Menace and received critical acclaim for playing a precocious teenager in the drama Anywhere but Here (both 1999). In addition, from 1999 to 2003, Portman attended Harvard University for a bachelor’s degree in psychology. She continued acting while at university, starring in The Public Theater’s 2001 revival of the play The Seagull and the sequel Star Wars: Episode II – Attack of the Clones (2002). Furthermore, In 2004. Portman was nominated for an Academy Award for Best Supporting Actress and won a Golden Globe Award for playing a mysterious stripper in Closer. Be extremely careful when looking for Natalie Portman autographs. She doesn’t sign much at all and at least over 95%, you find on sites such as eBay are in fact forgeries.